Save the date! Our Nationals Showcase is on Sunday, January 13th at 7pm in Peterson Gym. There will be performances in D1A Jazz, D1A Hip Hop, D1A All-Girl, D1 Small Co-ed and the TWO NEW divisions we are competing in this season: D1A All-Girl GAME DAY & D1A Co-Ed GAME DAY! We can wait to see You at our showcase! 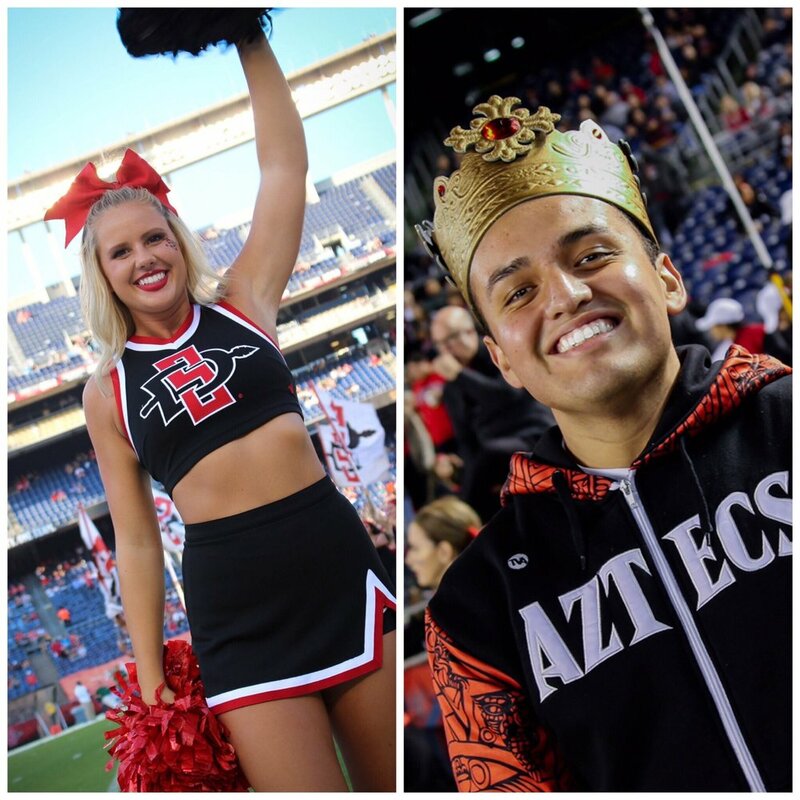 We are proud to announce that our Cheerleaders of The Game for the November 10th Aztec game against UNLV are Adrianna Bloom & Gilbert Rodriguez! Adrianna is a senior who is majoring in Communications and comes to our program from San Diego, CA. She is currently in her fourth season with SDSU Cheerleading. Gilbert is a sophomore who is majoring in Engineering. He comes to our program from Santa Ana, CA and is currently in his first season with SDSU Cheerleading. We are proud to announce that our Cheerleaders of The Game for the October 12th Aztec win over the Falcons from Air Force Academy are Haley Kyne & Devon Sanford! Haley is a senior who is majoring in Criminal Justice and comes to our program from San Diego, CA. She is currently in her fourth season with SDSU Cheerleading. Devon is a sophomore who is majoring in Biology. She comes to our program from El Dorado Hills, CA and is currently in her second season with SDSU Cheerleading. We are proud to announce that our Cheerleaders of The Game for the September 22nd Aztec win over the Eastern Michigan University are Riley Dorn & Shannon Huff! Riley is a senior who is majoring in Sociology and comes to our program from Simi Valley, CA. She is currently in her fourth season with SDSU Cheerleading. Shannon is a junior who is majoring in Psychology and minoring in Leadership Development. She comes to our program from Ramona, CA and is currently in her third season with SDSU Cheerleading. We are proud to announce that our Cheerleaders of The Game for the September 15th HUGE Aztec win over the Arizona State University are Shayd Silva and Duncan Martin! Shayd is a senior who is majoring in Business Accounting and comes to our program from Huntington Beach, CA. She is currently in her fourth season with SDSU Cheerleading. Duncan is a junior who is studying Kinesiology - Pre-Physical Therapy and comes to our program from Ramona, CA. He is currently in his third season with SDSU Cheerleading. Congratulations to you both! You make us all proud to be Aztecs! We are proud to announce that our Cheerleaders of The Game for the September 8th Aztec win over the Sacramento State University are Megan Hooks and Jordyn Serrino! Megan is a freshman who is majoring in Kinesiology - Pre-Physical Therapy and comes to our program from San Ramon, CA. She is currently in her first season with SDSU Cheerleading. Jordyn is a senior who is studying Communications & Journalism and comes to our program from Brick Township, NJ. She is currently in her fourth season with SDSU Cheerleading. Congratulations ladies! You make us all proud to be Aztecs! All Ages Clinic & Recruitment Clinic Dates Have Been Announced! The Football Halftime Performance Clinic is a four hour instructional clinic where participants will learn a sideline cheer and a dance that will be performed with the SDSU Cheerleading and Dance Teams during halftime of the SDSU Football Game on November 18th versus the Nevada Wolfpack. Registration includes a shirt for the participants to wear to the performance, admission into the football game and two additional tickets for family or friends. You can find the link to register for this event under our "Upcoming Events" page. We look forward to seeing you there! Are you interested in cheering on the collegiate level? Come find out if San Diego State University is the right fit for you! During this four hour clinic, participants will stunt and tumble with members of the SDSU Cheerleading Team, participate in a Q&A session with team members as well as get the opportunity to watch the teams perform their nationals routines for UCA Collegiate Nationals. Better yet, this event is FREE! For more information, please see our "Upcoming Events" page. 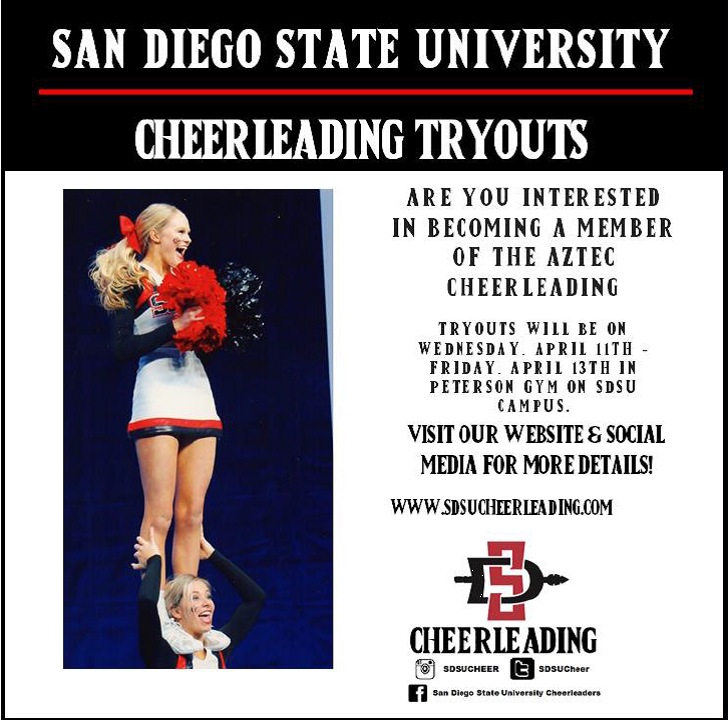 Come check out the SDSU Cheerleading Program and see what we are all about! You CAN Have This Aztec Life!